Creamy, spicy, and downright addictive is what you get with this Instant Pot Buffalo Ranch Chicken Dip! This is the perfect dip to make for entertaining, watching the big game or a weekend treat after a long work week. You can pair this with salty tortilla chips, crisp vegetables, or even a crusty bread. No matter how you serve this up, it will be one of the best Instant Pot dip recipes you will ever find. We are in full swing of cheering on our favorite football teams counting down to see who will qualify for the ultimate game day event! This warm dip is a must make at your game day parties right next to my Crack Chicken and Spinach and Artichoke dip. Both of which can be made right in your Instant Pot as well! 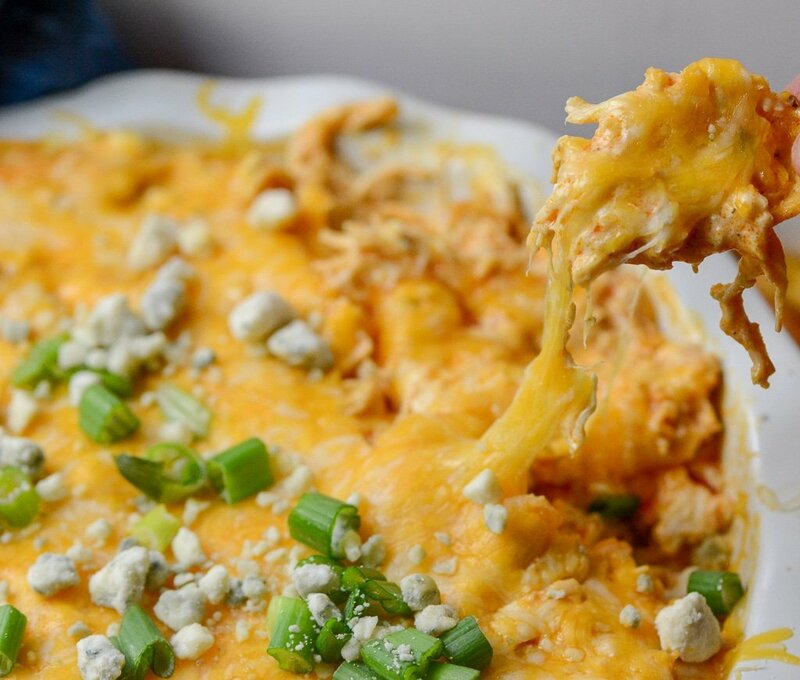 Have you ever made a buffalo chicken dip in the slow cooker? You know how creamy and delightful that is, but you have to wait all day for the dip to be ready to serve. The Instant Pot cuts down the cook time, so you have a faster dip that can be served up, without losing any quality in flavor. To be honest, the Instant Pot locks in so much flavor, it tastes better than a slow cooker version. 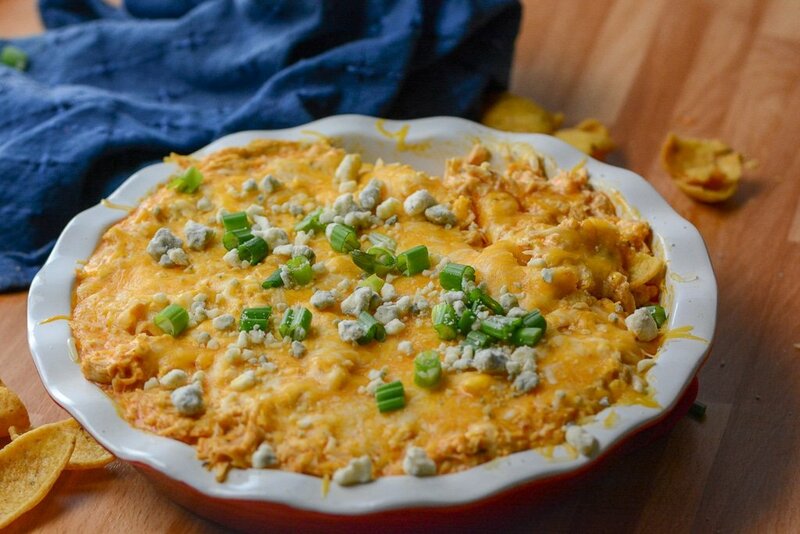 This buffalo ranch chicken dip is one easy appetizer that is a breeze to make. Best of all if you forgot to sit out chicken, that is okay! You can make this dip with frozen or thawed chicken. If you use frozen, just increase the cook time. I did use thawed chicken this go-around, I actually remembered to set some out! Go me. I am pretty well known with my family if there is a potluck I will bring my chicken dip. Why? Because it is so addictive. In our home buffalo chicken is always an option. We love the heat it packs and the ranch tames the spice, you can’t help but reach for another dip. I also, make a killer Instant Pot Buffalo Chicken Pasta dish. This is one delightful treat to break up the work week. How long does buffalo chicken dip last in the refrigerator? If you are lucky enough to even have leftovers, the chicken dip can last up to 3-4 days in the refrigerator. If you wait too long to eat the dip, you put yourself at risk for food poisoning. Day three is when I personally toss all leftovers. 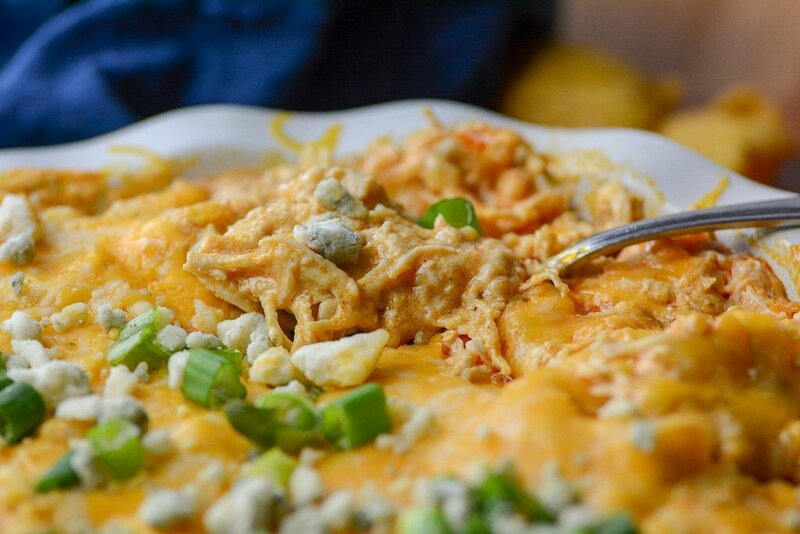 What crackers go best with Buffalo Chicken Dip? There is no wrong cracker to pair next to your buffalo dip! It is all about flavor and texture preference. Clubs, Ritz, Wheat Thins, are all valid options in our home. Then we add in chips like Fritos or tortilla chips, and even veggies and hearty breads. If it will dip, we will try it, is our motto. 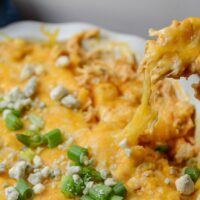 Give my Instant Pot buffalo ranch chicken dip a try. I think you will love the pairing of hot sauce next to the ranch and then the added cream cheese. Be prepared to fall head over heels for this warm buffalo dip. Instant Pot Buffalo Ranch Dip using Chicken Breast really is an amazing treat Creamy, Spicy and Cheesy with the Buffalo Flavor This really is a perfect chicken dip. Place chicken, cream cheese, butter, hot sauce, and a packet of Ranch dip in your Instant Pot. Yum!! This dip sounds absolutely delicious! 🙂 I love using my crock pot, and this is definitely something that I never would have thought of! This would be a great dip to take to my dad’s! This is perfect for holiday and football get togethers. I love serving unique foods. This looks delicious! Such a great game day recipe! This was so good! I made it for the superbowl and everyone raved about it! I had to cook it for an additional 10 minutes for the chicken to be totally done enough to shred. I was a little unsure about cooking things all together in my Instant Pot (minus the cheddar), but I had nothing to fear-this came out great! So much quicker and easier than any other recipe I’ve found and makes a nice, spicy dip! I just added enough cheddar to taste and only a few TBS of butter. The dip thickened up quickly after mixing in the cheddar. I will definitely make this again! Thank you for the great, easy recipe! What type of hot sauce please? Made this with Frank’s red hot and it was a hit at my office party – all of the dip was gone in 5 minutes. Next time I have to make more. Thanks for a yummy recipe! Do you cook it then transfer it to the dish you serve it in? Made this for an NYE party, and it was fabulous! I did get the burn notice briefly AFTER it came to pressure, so I just left it (set a timer) and let it do it’s thing, and it turned out perfect! I also increased the time to 20 minutes so it would shred a bit easier. I’ll definitely be making this again! Will this recipe work without liquid in It? I thought you always had to have some liquid to bring it to pressure? This turned out fabulous! I was skeptical myself..but It becomes very liquidy until you shred and stir it up good and add the cheddar..definitly a keeper! So I’ve been craving buffalo hot wings, and fried food is out, I’ve made baked wings, just ok. So today I made buffalo chicken dip. It was awesome. I used frozen chicken tenders, a cream cheese & yougurt lower fat version of cream cheese, only 2 tablespoons of butter and 1/2 cup water. I cooked this for 20 min in my instant pot shredded the chicken and served it with corn chips and celery. I did add a bit of shredded cheddar at the end. Yummy. Question, I have some cut up canned chicken from Costco, can I just dump that in the InstaPot? Has anyone tried doubling this recipe? If so, do u double the cooking time as well? How did it turn out? Has anyone done this using frozen chicken? You can use frozen same time it will just take longer to come to pressure. I made the mistake of doubling the recipe and it kept saying “burn”. Cleaned the pot and started over. Same thing happened. YUM! Made this for my super bowl party, and everyone loved it. I made a few edits: I only used a quarter stick of butter (1 stick just seemed like too much), I used 12 oz. of shredded cheddar cheese instead of 16 oz, and I cooked it for 20 minutes instead of 15 minutes. Served with carrot sticks, celerey, and triscuits. YUMMY! I just made this recipe for a large Super Bowl LII gathering. Expecting many people, I doubled the recipe. When we arrived, most people had already eaten their main course and my pot sat full and lonely. So, what to do with a double batch of this dip you ask. I boiled up some fusili pasta mixed it with the dip and vioula, Buffalo Chicken Ranch Mac & Cheese it is. My husband loved both the dip and the pasta version as well. RECIPE ADJUSTMENT RECOMMENDATION: I doubled every ingredient called for, which for out taste, rendered the dip as overtly salty. To counteract, I added additional cream cheese along with sour cream and some cottage cheese. To reduce the over saltiness, I would recommend starting with one dry packet of ranch while adding more to adjust for taste as you go along. Did you double the cook time too? No burn notice like others have experienced? I’m making this tomorrow and considering doubling it. How much is a serving? Is this Keto approved? Had anyone tried making this in the instant pot the night before and warming it up again the next day in the instant pot? I am not an instant pot rockstar yet. This was the 2nd recipe I tried. I got the burn notice pretty quickly also. My thought was not enough liquid? I added a little chicken broth but still got the burn notice. I just switched the setting to slow cooker and cooked it for a few hours. It is tasty but very runny ( I only added about 1/4 cup of chicken broth). Will try it again because it is yummy! Made this for super bowl and it was amazing. So quick and easy and the only change I made was I used half the butter and it still came out great. I had extra so the next night I cooked some elbow pasta and heated up the dip and stirred it in pasta. Kids loved the buffalo mac and cheese. I will be printing this and making again.